Mainly used for high-speed steel, tool steel, stainless steel quenching; stainless steel and titanium alloy solution treatment; magnetic materials, vacuum heat treatment and high-temperature brazing and vacuum sintering. The equipment for high-speed tool steel, measuring tool steel, die steel and other alloy steel vacuum quenching, with convection heating function, enabling quenching, quenching and other classification process, but also do tempering, annealing, carburizing, nitriding Other heat treatment process. The maximum cooling gas pressure is 6 bar or 10 bar. Can achieve rapid and uniform heating of low temperature, reasonable heating chamber structure, so that more uniform heating, heat loss, more energy. Equipped with efficient copper heat exchanger, high-speed high-pressure fan, to achieve rapid cooling of the workpiece. Heating chamber with stainless steel skeleton, a new type of carbon felt composite, less deformation, high temperature and pressure airflow scour, long life, easy to maintain. Graphite tube heater, easy to install and maintain, low failure rate. The air cooling adopts spray cooling method and the graphite nozzles are evenly distributed around the circumference to make the flow of high-pressure air flow more reasonable (the size of air volume of some main air ducts is adjustable. The customer can control the air volume of some main air ducts according to the characteristics of the workpieces) Deformation. 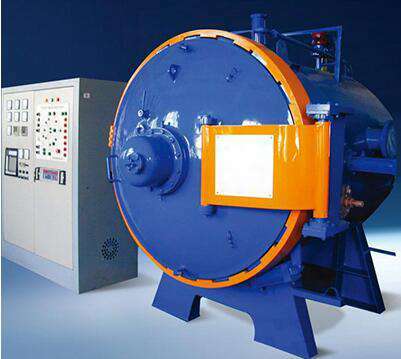 High-speed high-pressure high flow fan, copper – copper efficient round heat exchanger, to achieve high-speed cooling. Fans can be single-speed, two-speed, frequency control a variety of ways to control the air-cooled speed. Heating chamber can also be used all-metal structure to meet the titanium alloy, precision alloy solution treatment requirements. Electronic control system uses PLC and programmable temperature controller way to achieve fully automatic, semi-automatic, manual three control methods, flexible operation. 3: Furnace: Furnace sub-horizontal and vertical two, vertical furnace feed table (lid) lift using screw drive, automatic horizontal walking, flexible and reliable, easy loading.